A month away from the blog is the longest I've ever gone quiet. Among that time was a twelve day trip to Australia, tagging along with my husband who attended a conference in Perth and then continued to further business in Melbourne. The last time I visited Australia with him, I had a twelve year old home schooled boy in tow, so all my tourist activities were geared toward entertaining and educating him. This round, I focused on my own interests, visiting gardens, museums and galleries. The work that most amused me during my outings was the glass art of Richard Clements, whose delightful bird sculptures fascinated me when I visited Kirra Galleries in Melbourne. 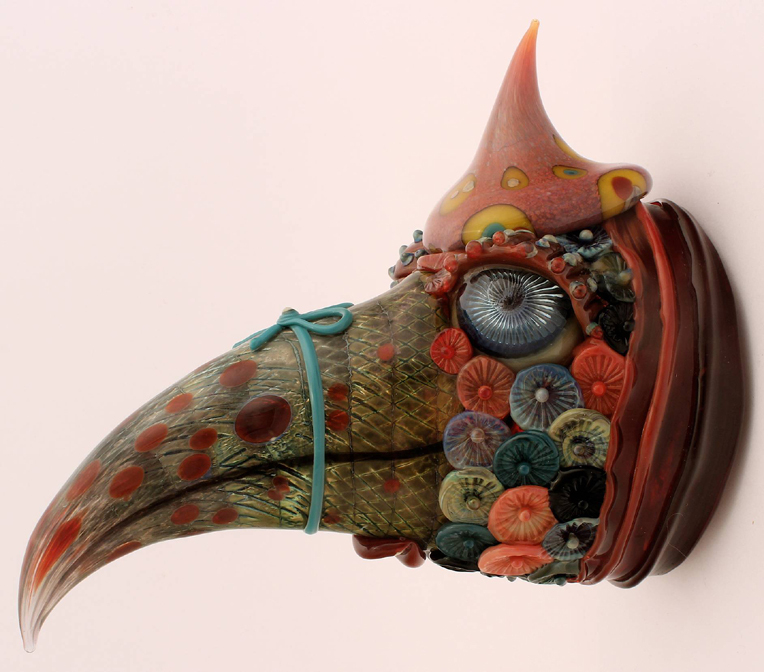 His "animals of unknown origins" were at once whimsical and masterful, mounted on the wall at eye level. 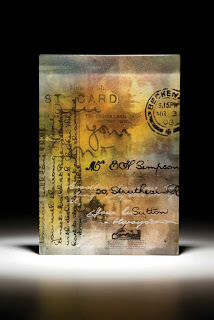 Kirra also displayed work by another glass artist that I've long admired, Kristen McFarlane, who specializes in layering images and text on glass. Indeed, if the prices on everything in Australia hadn't seemed to be twice what they are in the United States, I might have brought home a small piece of hers that particularly caught my eye, set as a diptych blue daguerreotype. Amongst the flame work included in the special exhibition I viewed that weekend were plenty of jewelry pieces, including typical beads. 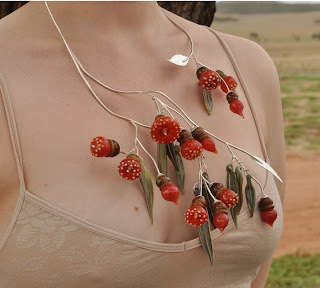 The most intriguing jewelry work was that of Terri Kraehe, whose necklace based on eucalyptus pods was simply stunning (and already sold). I find that although most of my recent work has been silver, I am still enormously drawn to glass. As I try to analyze directions for future work, I came away from this trip convinced that I need to somehow combine my glass and metal interests to produce work that is truly representative of my highest ideals. Now I just need to find time to explore the possibilities! Melbourne was a very inspiring city, and I hope to return again to explore more! Thanks so much, Carol, for the list of galleries to visit. I can't think of anywhere here with that density of jewelry galleries.